Ok so i was very lucky to be sent some goodies to test out from the body shop! I have a few things to review so this is part one...exfoliators!! I should start by saying my skin is combination..i get an oily t zone and normal cheeks! I love the citrus scent of this product..i always find that if a product smells lush I'm more likely to use it on a regular basis! However i imagined that the small silica crystals would be gentle..i was wrong..i find this exfoliator too harsh for my skin! I found i didn't want to rub much at all as it was very powerful! The citrus vitamin c did clear up all of my oil though and my skin felt and looked very matte and refined! All in all i would say sensitive skins stay away...id recommend this to someone with crazy dry skin that can take the strength of this exfoliator! 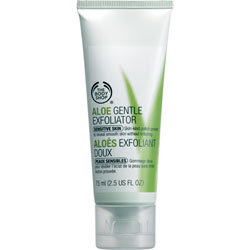 Also i think this product is a little pricey for an exfoliator! 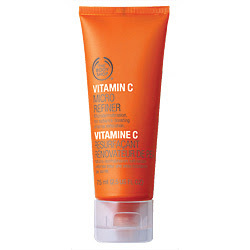 Great post...I have the Vitamin C Retexturising mask and it's really great for pepping up your complexion!